Although hardly a heatwave by any stretch of the imagination across the Midwest and south-central Canada where highs have warmed well into the 20s, even near 30 degrees for such cities as Minneapolis which hasn’t seen Freezing since December, welll, like everywhere else in the Midwest and heart of interior North America, the Arctic hound is set to run southbound once again, pile driving a fresh batch of very cold air down from the north, bringing daytime highs even to Minneapolis back to single digits and nights well below zero yet again. Stay tuned for more details tomorrow! 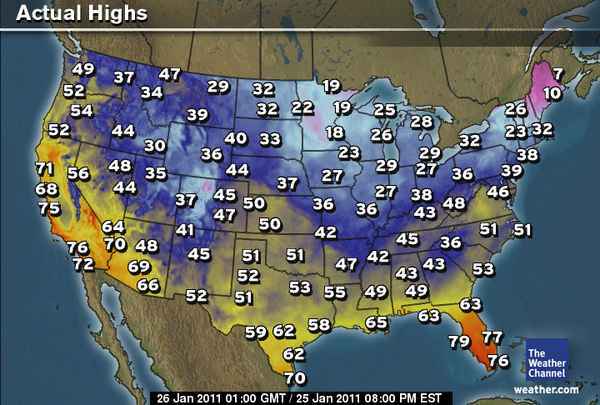 A READING OF -61.2C OR -78F WAS REACHED ON JAN 6TH, 2011 AND THIS WAS THE COLDEST SINCE JANUARY 2003! It’s currently 4.30am, Saturday and the temperature is hovering at -50C/-58F and down from -51C a short time ago. Nestled in a river valley deep in the heart of Far East Russia and just below the Arctic Circle, it’s “normal” for daytime high’s to warm to around -47C and by night fall to -51C. 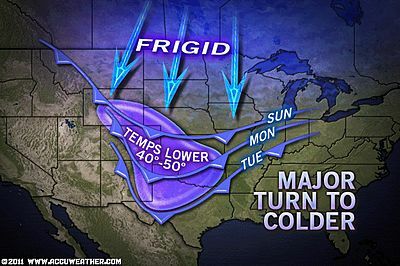 Yes, this is the “normal diurnal temperature range” in the POLE OF COLD! Amazingly, folks live here in what is known as the world’s coldest inhabited place on earth and temperatures in mid-winter regularly fall to between -55 and -60C. It appears that every few winter’s Oymyakon will see below -61C. Practically each and every winter drops to -60C, that’s -75F. Back on January 6th, after a high of -53.7C, the overnight low dipped to -61.2C and interestingly, this is in fact the lowest since January 2003 when the low dipped to a fraction lower at -61.4C or -78F. Cold air settles into this permanently frozen settled within lies nestled between mountain ranges, this village sees no warmth in winter. The warmest high this January was -21.1C.. shorts and t-shire weather for the locals? The coldest high this month was a frigid, brutal, unbelievable -54.8C or -67F. 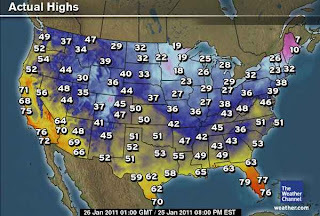 Folks that “high” is colder than most places on earth will ever get for a low at night. Clear, calm air embedded within the most powerful Arctic high pressure cells outside of Antarctica allow the atmosphere to become super cold, once firmly established by late Summer and early Fall and grows colder into early Winter, skies are almost always sunny by day, crystal clear by night and with a permafrost and snow covering literally thousands of miles in three directions surrounding, this kind of cold cold flow down the surrounding mountains and drain into the river valley in which the village sits. a cold inversion layer settles and with lack of sunlight intensity, this cold layer lying at the valley bottom won’t go anywhere and only grow colder and colder. Arctic High pressure shifts as well as weakens and strenghens but NEVER goes away, therefore we see flucuations in temperature, but nowhere near freezing, not even close. When that high grows and intensifies overhead, then Oymyakon sees nights dip into the -55C or lower range. Those unbelievely cold nights then make daytime temperature recover impossible to reach even -50C as air barely moves and without wind, the air can’t mix and warm. The last time this village has experienced a temperature of freezing or warmer was all the way back to October 7th, 2010. This week it’s moving around normal, with a trend to slightly cooler conditions for today, tomorrow and Saturday. Moisture from the gulf could enhance some orographic precipitation for Thursday and some scattered showers by Saturday, yet rain amounts should generally be less than 1/4 of an inch. Nuevo León, Coahuila and Tamaulipas should expect good conditions until Monday, with temperatures moving from the 40s and 50s early in the morning reaching 70s and 80s by the afternoon. Partially cloudy skies should predominate the next 4 days. 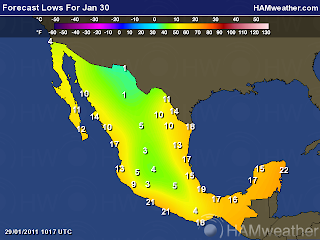 Since last week, computer models started trending to a serious cold period during the first week of February for Southern Texas and the entire NE Mexico. 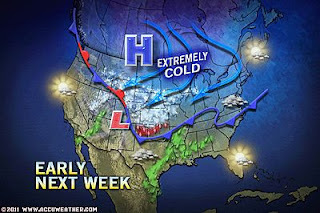 The GFS showed the cold and then fold back, while the Canadian, the European and the JMA show now consistently a severe period of cold weather through the first 7 days of February with temperatures plummeting below zero for Monterrey and most parts of the region with the potential of a snow/ice threat for even as south as Lower Rio Grande Valley. 2010 D.C. Snow Worst Since Little Ice Age?